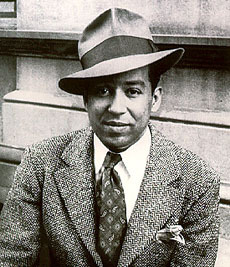 Langston Hughes (February 1, 1902 – May 27, 1967) began his career during the Harlem Renaissance period, living in DC for one year and four months, then moving to Pennsylvania and New York. While living in DC, he published his first book of poems, The Weary Blues (1926), and wrote most of the poems that would become his second book, Fine Clothes to the Jew (1927). In all, he would publish 15 books of poems during his lifetime, including The Dream Keeper (1932), Let America Be America Again (1938), Shakespeare in Harlem (1942), and Montage of a Dream Deferred (1951). He also published novels, short story collections, nonfiction, plays, works for children, and two memoirs, The Big Sea (1940), and I Wonder as I Wander (1956). He began writing his popular Simple stories, short fiction about a character named Jesse B. Semple, in 1943. His letters and collected works were published posthumously. The Capitol, lit up at night, was exquisitely lovely; and we walked back and forth to the Library, through its park, with those great old trees. Washington is really becoming a lovely place. Fountains play. And the weather was as balmy as spring.